Since the 2nd of February 2015, id3 Technologies has been responsible for the biometric security of daily transactions made by the 1,000 solicitors’ offices in Colombia. Every month one million transactions are now processed, perfectly secured and in compliance with Colombian law, thanks to id3 Technologies fingerprint recognition and identification management solutions. 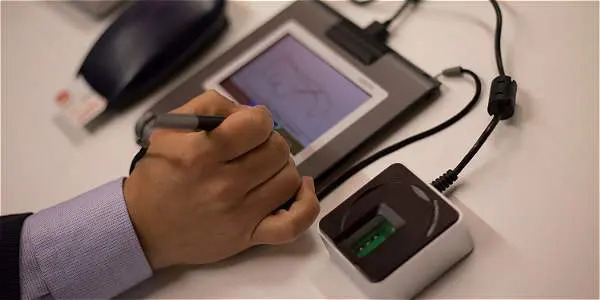 The Colombian National Civil Registry office has just granted id3 Technologies biometric operator status, opening the way to the development of a range of projects requiring strong, secure and validated authentication by the highest Colombian authorities. As a result of this recognition, id3 Technologies announces the creation of a branch in Bogotá: id3 LATAM at Avenida Carrera 9 # 127c – 60. Founded in Grenoble in the heart of France’s Silicon Valley in 1990, id3 Technologies has optimised the opportunities presented in this High Tech environment to become a leading company in the development and design of electronic products, biometric solutions and RFID. Known worldwide for their involvement and innovative solutions in a range of international projects, id3 Technologies provides technology certified by the American NIST (National Institute of Standards and Technology) for MINEX III fingerprints tests and FRVT facial recognition. Every day, our team of 40 – 90% engineers – imagine, design and develop cutting-edge technology to make our clients’ ideas reality. With 25 years of experience, id3 have implemented products and solutions for their clients in a range of fields, including energy management, home automation, industrial IT, communication sensors, and physical and intelligence security management.